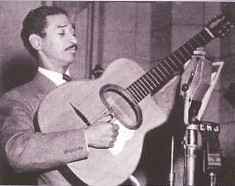 Oscar Aleman (Born : February 20, 1909 in Resistencia , Chaco, Argentina - Died : October 14, 1980 in Buenos Aires, Argentina) was a renowned Argentinian guitarist. Formed Les Loups (Los Lobos) with Gaston Bueno Lobo in 1925, which toured in Brazil, Argentina. In the '30s, he spent long periods in Spain and Paris, where he became Josephine Baker's accompanist and befriended with Django Reinhardt. Aleman relocated to Buenos Aires in the early '40s and continued to record and perform with both a swing quintet, as well as with a nine-piece orchestra. In 1972 at age 63, Aleman recorded a new album which helped re-launch his career with the reissue of many of his previous recordings, along with concert dates and television appearances. He continued to teach and perform in his native Buenos Aires until his death in 1980.